Glucosamine & Chondroitin Extra Strength is a dietary supplement that helps to maintain the normal structure of the musculoskeletal system and improve the condition of joints. The preparation contains a unique, highly assimilable composition of glucosamine sulphate, and chondroitin sulphate of natural origin (bovine cartilage). Glucosamine is a natural substance, a glucose derivative, synthesised in the organism from glucose and glutamine molecules in the presence of the enzyme glucosamine synthetase. Glucosamine is produced in the organism in little amounts, and the ability to synthesise it decreases with age. A relatively high content of glucosamine in joint cartilage was a signal for scientists that the substance can prove very beneficial when it comes to osteoarthritis. Glucosamine is a substrate for the production of glycosaminoglycans and proteoglycans, which constitute a component of the intracellular substance in cartilage. As glucosamine cannot be found in any food product, it must be delivered in the form of supplements. Chondrocytes (cartilage tissue cells) have been demonstrated to use glucosamine for integrating its molecules into glycosaminoglycan chains. Glucosamine also has the ability to reduce the activity of selected enzymes (for example matrix metalloproteinases), which participate in the degradation of joint cartilage. The beneficial effects of glucosamine have also been observed in the case of cartilage tissue with osteoarthritis. As a result of improper regenerative processes, dividing chondrocytes have trouble reaching the damaged areas of the cartilage, the reason being for example that the capability of adhesion to intracellular matrix proteins is decreased. It has been demonstrated that glucosamine sulphate taken in the dosage of 50-500 µmol helps to improve the adhesive properties of proteins (especially fibronectin) in chondrocytes obtained from bones with degenerative lesions, thanks to which it supported the regenerative processes of damaged tissues. Glucosamine is also believed to be able to help to inhibit the activity of pro-inflammatory cytokines IL-1β and reduce the synthesis of prostaglandins (PGE2) and nitrates, which can explain its beneficial effect on improving regenerative processes. People who took glucosamine were demonstrated to have a milder course and pains than patients who struggled with regular discomfort caused by their joints. Other tests showed pain reduction, a less pressing need to take analgesics, and a general improvement of well-being in people with osteoarthritis of the knee. Moreover, it turned out that supplementation enhances joint mobility and general physical activity in patients. Chondroitin is an organic compound of the glycosaminoglycan group. It is a mucopolysaccharide consisting of alternating glucuronic acid residues and N-acetylgalactosamine. Chondroitin is part of joint cartilage and helps to reduce friction between the mobile elements of the joint. Chondroitin exhibits anti-inflammatory properties and stimulates the production of synovial fluid, thanks to which it supports joint mobility, increases cushioning, and reduces inflammations and pain. Chondroitin is a compound produced in the organism, so it is constantly used during movement. The substance can be delivered with food, although it is found mainly in bovine and shark cartilage, which are products with strongly limited availability; therefore, both chondroitin and glucosamine are worth supplementing in the comfortable and efficient form of tablets. 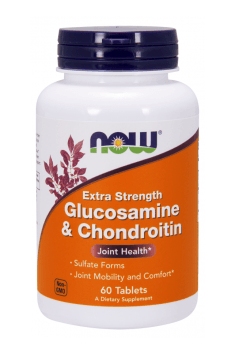 To sum up, Now Foods Glucosamine & Chondroitin is a dietary supplement recommended especially for physically active people. The preparation is an indispensable element of everyday supplementation among people exposed to an increased risk of fractures, falls, and other injuries that lead to pain and discomfort during exercising. Excessive joint exploitation does not only concern sportspeople, so the preparation is also recommended for overweight people, the elderly, and those who do heavy physical work. The supplement can also prove fantastic in the case of joint pains and their limited mobility that accompany osteoarthritis. Glucosamine & Chondroitin Extra Strength 60 tab. 2 capsules twice a day, preferably during a meal. The commonly used, efficient doses of glucosamine and chondroitin are respectively 1,500 and 1,200 mg. What’s very important, the doses are contained in the portions recommended by the manufacturer (2 capsules). In order to obtain as many benefits from using the preparation as possible, take it regularly for 6-12 weeks, especially if you are in the risk group (sportspeople, seniors, blue-collar workers) and when first symptoms occur signalling the deterioration of the musculoskeletal system.